All through this year, one word has guided my actions, behaviours and choices. When in doubt, I took a deep breath and let out the word 'Embrace' and grasped on to what life had to offer me, embracing the challenges, the tears, the love, the laughter....Embracing the journey. One word has the power to change your life. It truly does. One word that defines who you want to be and how you want to live. One word that you can live with everyday for a year. It changes you. Holding on to 'Embrace' sure has changed me this year, all for the good. As I usher in 2016, I have decided my word for the year to be Focus. I have no idea what the new year will bring, but I'll stay Focused to the goals I've set for myself and engage in them with intention and commitment. I am a person with many interests and while that is good I often find myself saying yes to multiple projects at a time and then not being able to focus on them with dogged determination. So this year I want to Focus. Really make it happen, one goal at a time. What about you? How are you ushering in the new year, with what goals, what word? Co-hosting Blogchatter prompt this week with Kala. Write a post on 'Ushering the New year' and connect with us here in the linky below. Thank you, Laurel! Wish you a very Happy 2016 too! I like your choice of word, Aditi. Wish you success with what you aim for in the New Year! 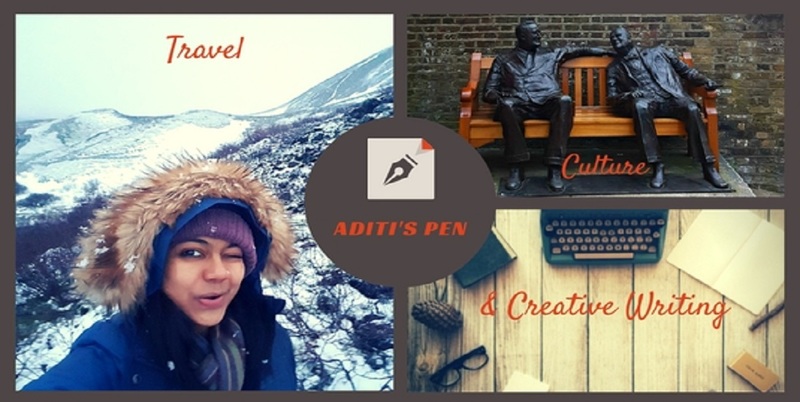 Hey Aditi, Loved your post . I wrote mine for the prompt before reading yours and now I plan to write another one about 'words' that defined last year and the words that would constitute my Visionboard for next year. Have a wonderful new year and happy blogging! Brilliant idea! I've always wanted to make a vision board..inspire me girl! Hey Aditi! What a lovely vision for 2016! I think Focus is something I could do with too...what with varying interests in numerous directions! Loved your post! Wish you a wonderful year filled with all you want to achieve and more! Great post. I'm FOCUSing an F word every week until I'm 50. It is FUN and encouraged me to blog regularly. You inspire Louise! Keep going strong! My My My.... !!!! I just wrote my post and came here to read this. Would you believe this!! My word for 2015 was Embrace and for this year is Focus! :D Yay, there we go. All the very best Aditi!! Nice way to usher in the New Year! I love the word Focus. 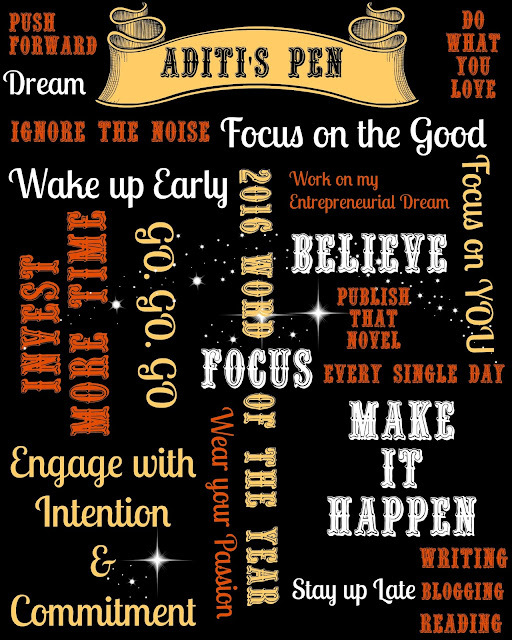 I hope 2016 is a focussed year for you! I set out my own goals/intentions for 2016 all having to do with the word 'Kind'. Lovely word! :) Have a fantastic 2016! That's a very powerful word, and can be used in so many different situations. I hope that 2016 is all you focus on! Great post! Praying that you can remain focused. Happy New Year! You had a fantastic 2015. You embraced what life offered you on your journey. Focus is a great word to start the year off with. Thanks so much! Hope you have a great year ahead! What a fab year you've had!! My phrase for 2016 is "peace of mind"
Peace of mind...we all aim for that! Love! Looks like you had a great 2015. Wishing you an even better 2016. My word for 2016 is Creative. Thank you Suzy! I saw your digital art work yesterday. You sure are making your 'word of the year' count. Wow. Happy New year :D Focus. I love the word. Really inspired by your post and plan to follow the word for myself too. Yay Sherna, glad I could help inspire you! Thanks Eli! Hope you had a fabulous holiday! All the beat for 2016 my friend. Love & Hugs!